The perfect size & color--every time! Redeemable for one garter holster, either online of in person at our show booth. The Gift Card is good for one Femme Fatale Garter Holster. The Gift Card covers the cost of the garter holster. Applicable taxes on the garter holster will be assessed at time of purchase of the gift card. Shipping costs for the garter may still apply. 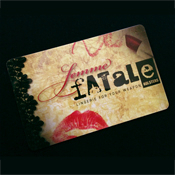 Gift cards are redeemable either in person, or online at femmefataleholsters.com. Gift cards will not be replaced if lost or stolen. Gift cards are not exchangeable for cash. Copyright © 2013-2019 Femme Fatale Holsters. All rights reserved.